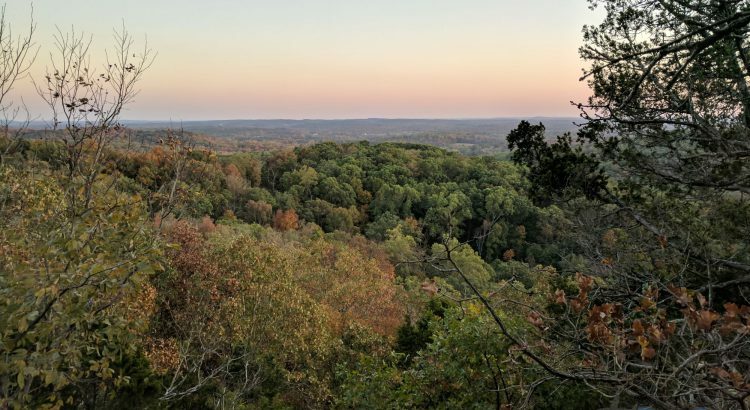 In the middle of October, we decided to do a backpacking trip in Southern Illinois at the Garden of the Gods in the Shawnee National Forest. We had a free weekend and the weather looked like it would be good so we went for it. The forest was about a 4 hour drive from our house to get there. We decided to hike a portion of the River to River trail which goes 160 miles from the Ohio River to the Mississippi River. Information regarding the trail is a bit sparse, but these were the best resources I found for maps, trail conditions, and water sources. http://rivertorivertrailhike.com – Best overall information. Has maps of every section along with trail updates. Very active in clearing trail and reporting conditions. After caching some water (sources were going to be limited on the section we were hiking), we arrived at the trailhead right around lunch time. We had a quick lunch at the car and then headed out on the trail. We decided to make a more circuitous route to see some more of the Garden of the Gods. The rock formations and views from the bluffs were fantastic. Sure, it pales in comparison to what you find in Colorado and out west, but it definitely wasn’t something I expected to find in Illinois. We eventually made it to a camping spot late afternoon. There are 3 well-defined camping spots along the trail in Garden of the Gods, but dispersed camping is allowed along the trail as well. I’ll let the views from our tent speak for themselves. Sunsets and sunrises were beautiful. We had our freeze-dried dinners which were actually pretty good. While expensive, the Mountain House meals aren’t too bad. We spent the rest of the evening reading, relaxing, and playing cards. Maybe it was due to the season, but we didn’t see hardly any wildlife along the trail the entire trip. A couple squirrels were about all we saw. Still, I decided to hang our food and not take any risks. Due to good weather, we left the rainfly off the tent and slept under the stars. Having left the rainfly off, we woke to a beautiful sunrise. We decided to walk further down the River to River trail today, turn around, and camp back at the same spot again. It was a somewhat lazy morning where we had breakfast. We walked about 5 miles down the trail. Unfortunately, a lot of this section was along a road and not especially scenic. We eventually made it to a river bed where we had lunch and filtered and filled our water containers. It was an especially hot day for October – about 90 degrees – which was very exhausting, especially on the parts of trail along the road without much tree coverage. Then, to get back to our campsite, there was a steep climb up to the top of the bluff that really wore us out. The parts of the trail going up and down bluffs are very rocky which makes things difficult as well. Once back at camp, we relaxed, read, played some cards, and made dinner to wind down the day. There was another beautiful sunset today. Due to some threatening weather, we had to put the rainfly on which made sleeping a little tough due to the heat and humidity. We began packing up camp to try to beat the weather. However, as soon as we had the rainfly off, Sam says “uh-oh” and I turn around to see a big storm coming up over the bluff. Soon after, it began to pour. We managed to get all of our wet gear put away and have a soggy, but at least warm breakfast. Then we began our trip back. The rain had turned the trail into a muddy, slippery mess. The going was very slow, especially downhill where there was a lot of sliding around, especially on the now very slick rocks. No falls at least, but it was difficult. We eventually made it back and headed home. All in all, it was a fun adventure. It was only our second backpacking experience, but we look forward to taking more trips especially to the National Parks in the western states. The Grand Canyon rim to rim trail is near the top of our list of destinations. We enjoy our cruises and trips to big cities, but it’s reinvigorating to spend time in nature and just slow down and take in the view. Hello Brian. Where did you begin your hike? Which portion of the River to river trail did you hike that allowed you to look back? And how many miles did you cover each day? We are hoping to do a backpacking trip in GOG this spring. Thanks. We started at the Garden of the Gods Recreation Area near Herod, IL as there is a backpackers parking lot there. We hiked west from this point. Most of the trail is in the Shawnee National Forest, so you can set up camp wherever you wanted. That being said, there were some established camping locations along the trail. We only had a weekend so we did an out-and-back covering about 10 miles each day. Let me know if you have any more questions.